Language policy in Ukraine is based on its Constitution, international obligations, and from 2012 until February 2018 on the law "On the principles of the state language policy" (before 2012, the 1989 law "On the languages in the Ukrainian SSR" was in force). The Ukrainian language is the state language of Ukraine. According to the article 10 of the Constitution of Ukraine, the State has to ensure the comprehensive development and functioning of the Ukrainian language in all spheres of social life throughout the entire territory of Ukraine. Other languages spoken in Ukraine are guaranteed constitutional protection. Russian is recognized as the language of a national minority. A 2012 law, called the law "On the principles of the state language policy" gave the status of regional language to Russian and other minority languages. It allowed the use of minority languages in courts, schools and other government institutions in areas of Ukraine where the national minorities exceed 10% of the population. The law was used mostly in Ukraine's southern and eastern regions, where predominant or significant parts of the population speak Russian as their first language. Three minor settlements did the same for Hungarian, Moldovan and Romanian. Ukrainian remained the only official country-wide language. Introduction of the law was supported by the governing Party of regions and opposed by the opposition parties. According to its opponents the law undermined and supplanted the role of the Ukrainian language, and violated Article 10 of the Ukrainian Constitution. The bill was adopted amid fistfights in the Ukrainian Parliament building on 3 July 2012, and the opposition said that the procedure of adopting the law was not respected. The law came into force on 10 August 2012. Since then various cities and regions of Ukraine declared Russian a regional language in their jurisdictions. Other cities and regions declared their opposition to this law. Immediately after the 2014 Ukrainian revolution, on 23 February 2014, the Ukrainian Parliament voted to repeal the law. This decision was vetoed by the acting President Oleksandr Turchynov, who instead ordered drafting of a new law to "accommodate the interests of both eastern and western Ukraine and of all ethnic groups and minorities." However, in October 2014 the Constitutional Court of Ukraine started reviewing the constitutionality of the law, and on 28 February 2018 it ruled the law unconstitutional. 3 Bill "On the principles of the state language policy"
Percentage of native speakers of Russian from the 2001 census. Russian is a regional language in 13 regions (shaded) with 10% or higher. Since the fall of the Soviet Union and the independence of Ukraine, the Russian language has dwindled, but remains one of the two most used languages for business, legal proceedings, science, artistry, and many other spheres of everyday life. 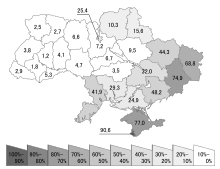 According to the 2001 census, 67.5% of the citizens of Ukraine regard Ukrainian as their native language, with Russian being considered the native language for another 29.6%. Various other languages constitute the remaining 2.9%. During the Soviet era, both Russian and Ukrainian had official status as state languages of the Ukrainian SSR. Supporters of the bill argued it would make life easier for Russian-speaking Ukrainians. Opponents fear adoption of Russian as a minority language could spread rapidly, challenging Ukrainian and causing splits between eastern and western Ukraine. In practice Russian is already used widely[specify] in official establishments in Ukraine. According to the article #27 (2nd part) it is necessary to translate Ukrainian place names into other languages using only Ukrainian transcription (the transcription of the state language). On 9 February 2013 the authors of the 2012 language law, Serhiy Kivalov and Vadym Kolesnichenko, were awarded the "Medal of Pushkin" by Russian President Vladimir Putin for "great contribution to the preservation and promotion of the Russian language and culture abroad". Bill "On the principles of the state language policy"
V. Kolesnichenko, one of the authors of the law, refers to its support from various higher education bodies, scientists and NGOs. Some say that the bill contradicts the Constitution of Ukraine, violates the Budget Code, and aims to annihilate the Ukrainian language. It suffered a criticism in the conclusions of state authorities and their departments: the Main Scientific-Expert Bureau of the Ukrainian Parliament (23 May 2012), the Parliamentary Committee on Culture and Spirituality (September 23, 2011), the Parliamentary Committee on Budget (3 November 2011), Ministry of Finance (9 September 2011), the Ministry of Justice (27 September 2011). The bill also failed to obtain the support of the specialized institutions of the National Academy of Sciences of Ukraine: the Linguistics Institute, the Institute of the Ukrainian Language, the Institute of political and ethno-national researches, the Shevchenko Institute of Literature, the Institute of State and Law, the Ukrainian linguistic-informational Fund, the Philology Institute of Kiev University, and the Academy of Sciences of the High School of Ukraine. In December 2011 the Venice Commission of the Council of Europe issued its Opinion on the draft law. According to Ukrayinska Pravda, the Venice Commission did not notice in the draft law of Kolesnichenko any guarantees of the protection of the Ukrainian language and later came to a decision that the bill is another "pre-election tool" for the Party of Regions. V. Kolesnichenko, one of the authors of the law, claimed the 2011 analysis of the Venice Commission was "generally supportive". The opponents noted that the analysis contained strong criticism, specifically about the failure to protect the role of Ukrainian as the State language. "It seems questionable to the Venice Commission that the parallel use of the State language and regional and minority languages, and in practice mostly the Russian language in large spheres of public life and not only on a local level, can still be considered to be in compliance with article 10 of the Constitution, as clarified by the Constitutional Court." "The recognition of linguistic freedom in the media and in the cultural area could moreover, due to market considerations, result in the dominance of the Russian language." The Opinion also made other observations and proposals of change. It was of the view that "further improvements, increased guarantees and more substantial changes to the normative content of the Draft should be introduced..."
Prior to 24 May 2012 there were rumours that a revision of the legislation on languages would take place in parliament (the Verkhovna Rada) and that the Secretary of National Security and Defense would attend the session. Some 1,000 protesters gathered just outside the Verkhovna Rada building setting up another tent city. State law enforcement warned the protesters not to establish a tent city. The protesters were yelling in Ukrainian "Get busy with work, not a tongue" (implying the law draft on languages). Some posters carried the slogan: "The problem is in poverty, not in language". At the evening session the parliamentary opposition in the Verkhovna Rada (BYuT and Our Ukraine) blocked the main tribune in parliament as some representatives from the Party of Regions surrounded the presidium. The speaker was forced to announce a break in the session. After the break Member of Parliament Vyacheslav Kyrylenko read a statement of the united opposition not to conduct any hearings regarding language issues. After the law draft #10154 "On the state language of Ukraine" was not adopted onto the daily agenda, Kyrylenko withdrew his draft #9059 "Prohibition of narrowing the sphere of use of Ukrainian language" from a revision, while Kolesnichenko gave a presentation on his draft #9073. The head of the Committee On Issues of Culture and Spirituality Volodymyr Yavorivsky disclosed the decision of the committee to reject the bill #9073 as it was the decision of the committee's majority. He pointed to the fact that the law draft in fact will introduce a bilingual situation in number of regions. However, after a review the bill was supported by the parliamentary majority which showed its support in adopting two state languages: Ukrainian and Russian. The parliamentary minority and the deputy group "Reforms for the Future" stayed in opposition to the bill. Parliament speaker Volodymyr Lytvyn was forced to hastily close the session as further discussion descended into another scandalous fight leaving some members of parliament injured. The Party of Regions released a statement to the press where it accused the opposition of denying the adaptation of a bill that protects some constitutional rights of millions of citizens of Ukraine. PoR leader in parliament Yefremov promised to revisit the issue once everything is stable. The bill was to come into force only after it was signed by Ukrainian President Viktor Yanukovych and the Chairman of Parliament. But the Chairman of Parliament Volodymyr Lytvyn tendered his resignation on 4 July 2012. However, the Verkhovna Rada twice held votes of confidence in the speaker, and did not accept his resignation. On 31 July Lytvyn signed the law. The bill was signed by President Yanukovych on 8 August 2012. The law came into force on 10 August 2012. Since then various Ukrainian cities and regions have declared Russian a regional language in their jurisdictions, these being the municipalities of Odessa, Kharkiv, Kherson, Mykolaiv, Zaporizhia, Sevastopol, Dnipropetrovsk, Luhansk and Krasny Luch; and the Oblasts of Odessa, Zaporizhia, Donetsk, Kherson, Mykolaiv and Dnipropetrovsk. Hungarian has been made a regional language in the town of Berehove in Zakarpattia Oblast, Moldovan in the village of Tarasivtsi (Chernivtsi Oblast), and Romanian in the village of Bila Tserkva; also in Zakarpattia Oblast. These languages will now be used in city/Oblast administrative office work and documents. As of September 2012 there were no plans for such bilingualism in Kiev. Chairmen of the Supreme Council of Crimea Volodomyr Konstantinov stated in March 2013 that the August 2012 law had changed nothing in Crimea. On February 23, 2014, the second day after the flight of Viktor Yanukovich, while in a parliamentary session, a deputy from the "Batkivshchina" party, Vyacheslav Kyrylenko, moved to include in the agenda a bill to repeal the 2012 law "On the principles of the state language policy". The motion was carried with 86% of the votes in favour—232 deputies in favour vs 37 opposed against the required minimum of 226 of 334 votes. The bill was included in the agenda, immediately put to a vote with no debate and approved with the same 232 voting in favour. The bill would have made Ukrainian the sole state language at all levels. Still, all the minority languages (including Russian) remain explicitly protected under article 10 of the Ukrainian Constitution. The repeal would also bring back into force the previous law on languages, which was in place in Ukraine for 23 years before July 2012 and was regulating the use of the minority languages. According to Uilleam Blacker, the repeal bill contained no specific threat to the Russian language. However the move to repeal the 2012 law "On the principles of the state language policy" provoked negative reactions in Crimea and in some regions of Southern and Eastern Ukraine. It became one of the topics of the protests against the new government approved by the parliament after the flight of Viktor Yanukovich. In this context, the next major development was the Crimean crisis. Passage of the repeal bill was met with regret by the Secretary-General of the Council of Europe. The OSCE High Commissioner on National Minorities expressed concern over possible further unrest. He also proposed to give advice and facilitate discussions on new legislation, declaring that "we must avoid the mistakes made last time [in 2012] when unbalanced legislation was adopted without a proper dialogue in the Verkhovna Rada." The bill was also criticized by the Ambassador for Human Rights of the Russian foreign ministry. Bulgarian and Romanian foreign ministers evaluated it as a step in the wrong direction, and the Greek foreign minister expressed disappointment. The Hungarian foreign ministry expressed serious concerns, noting that the decision "could question the commitment of the new Ukrainian administration towards democracy". The Polish foreign minister called it a mistake. After urgently ordering a working group to draft a replacement law on February 27, acting President Oleksandr Turchynov declared on 3 March that he will not be signing the repeal bill until a replacement law is adopted. Since then the repeal bill is not signed, but not vetoed by President, its current status is "ready for sign". On 7 April 2014 former BYuT leader Yulia Tymoshenko stated she supported the 2012 language law. On 3 November 2014, newly elected president Petro Poroshenko declared that the language policy in Ukraine will be amended. On 10 July 2014 57 parliamentary deputies appealed the Constitutional Court of Ukraine to review the 2012 law "On the principles of the state language policy". On 10 October 2014 the court opened the proceedings on the constitutionality of the law. On 14 December 2016 the Constitutional Court ended the oral proceedings and on 13 January 2017 moved to the closed part of the process. On 28 February 2018 the Constitutional Court of Ukraine ruled the law unconstitutional. On 4 October 2018, the Ukrainian parliament voted with a majority of 261 MPs in the first reading of a new language law (bill n. 5670-d, "On provision of the functioning of the Ukrainian language as the state language"). Thereafter, the bill "was prepared for second reading for about four months. During this time, the Verkhovna Rada's committee on culture and spirituality worked out over 2,000 amendments to the document that were proposed by people's deputies. In particular, the document proposes creating the national commission on the standards of the state language and introducing the post of commissioner for the protection of the state language. Lawmakers started considering the document at second reading on February 28. The Verkhovna Rada continues to review amendments to the bill during March 12-15." The latest row between Kiev and Budapest comes on the heels of a bitter dispute over a decision by Ukraine’s parliament – the Verkhovna Rada – to pass a legislative package on education that bars primary education to all students in any language but Ukrainian. The move has been widely condemned by the international community as needlessly provocative as it forces the historically bilingual population of 45 million people who use Russian and Ukrainian interchangeably as mother tongues to become monolingual. Furthermore, the large minorities of Hungarians, Jews, Poles, Tatars, Gypsies, Romanians, Caucasians, and Gagauz generally speak and receive some formal or informal education in their own national languages, all of which will be adversely affected by the new draconian language statutes. The Unian reported that "A ban on the use of cultural products, namely movies, books, songs, etc., in the Russian language in the public has been introduced" in the Lviv Oblast in September 2018. ^ "Constitution of Ukraine: General Principles: Article 10". 28 June 1996. Archived from the original on 21 May 2011. CS1 maint: Unfit url (link) of the Constitution says: "The state language of Ukraine is the Ukrainian language. The State ensures the comprehensive development and functioning of the Ukrainian language in all spheres of social life throughout the entire territory of Ukraine. In Ukraine, the free development, use and protection of Russian, and other languages of national minorities of Ukraine, is guaranteed." ^ a b c "Lytvyn: Program for development of Ukrainian language should be adopted before elections". KyivPost. Interfax-Ukraine. 2012-08-24. ^ a b c d e Elder, Miriam (2012-07-04). "Ukrainians protest against Russian language law". theguardian.com. ^ a b c d e "Romanian becomes regional language in Bila Tserkva in Zakarpattia region". Kyiv Post. Interfax-Ukraine. 2012-09-24. ^ a b "На Украине отменили закон о региональном статусе русского языка". Lenta.ru. Retrieved 2014-02-23. ^ a b "Ukraine's parliament-appointed acting president says language law to stay effective". ITAR-TASS. 2014-03-01. ^ "Rushed law on Russian provokes Ukraine fury". The Scotsman. 4 July 2012. ^ (in Ukrainian) "Регіони" запевняють, що "шабаш" не завадить їм "захистити мову"
^ "Popov: No bilingualism in Kyiv". Kyiv Post. Interfax-Ukraine. 2012-09-19. ^ "Ukraine: Speaker Oleksandr Turchynov named interim president". BBC News. 2014-02-23. ^ Kramer, Andrew (2 March 2014). "Ukraine Turns to Its Oligarchs for Political Help". nytimes.com. ^ (in Ukrainian) Проект Закону про визнання таким, що втратив чинність, Закону України "Про засади державної мовної політики"
^ "Проект Закону про забезпечення функціонування української мови як державної". w1.c1.rada.gov.ua. Retrieved 2019-02-22. ^ "Ukraine's parliament supports draft bill on state language as basis". 112.international. 4 October 2018. Retrieved 2019-02-02. ^ "Parliament passes bill on Ukrainian language at first reading". www.ukrinform.net. 4 October 2018. Retrieved 2019-02-02. ^ "Council of Europe urges Ukraine to adopt language bill after elections". www.ukrinform.net. 12 March 2019. Retrieved 2019-03-12. ^ "Lviv region bans movies, books, songs in Russian until end of Russian occupation". Unian. 19 September 2018.